Nominations for QAVS 2019 are now officially closed. 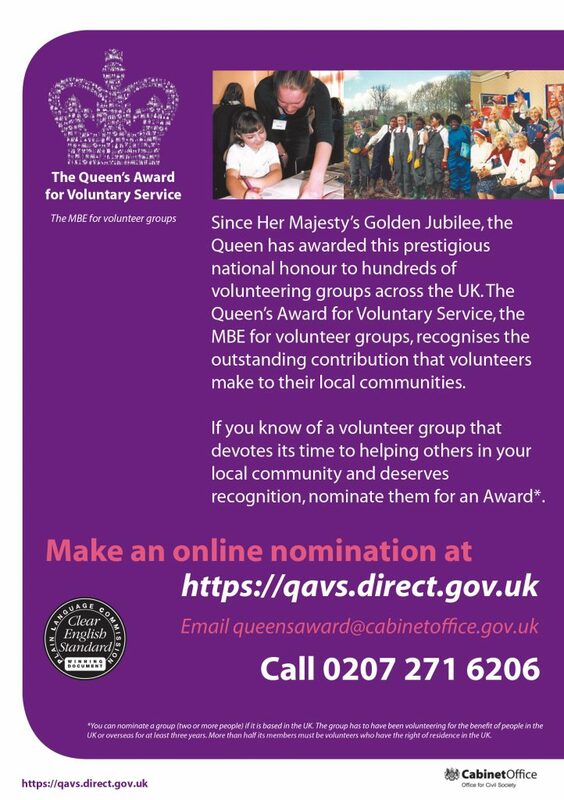 The nominations for QAVS 2020 will re-open in April 2019. 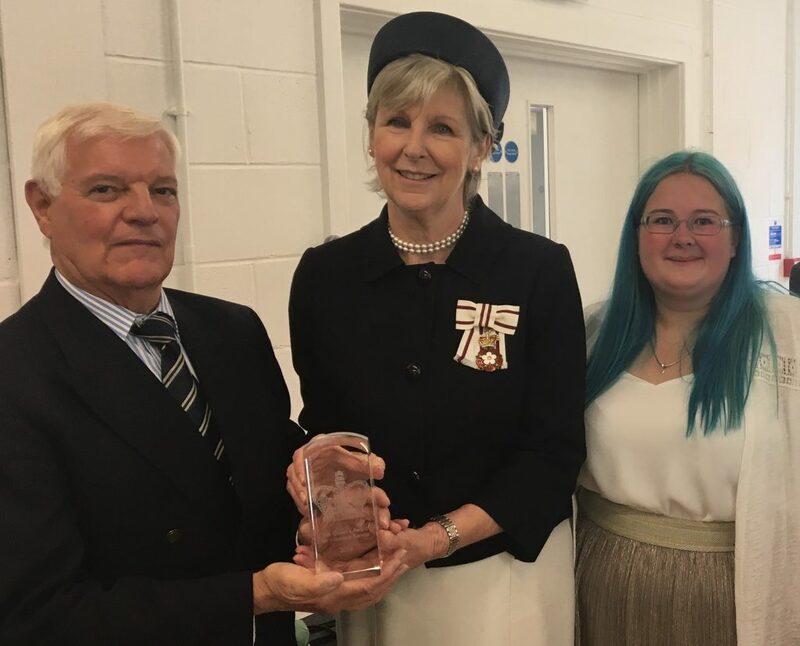 The Lord Lieutenant Mrs Jennifer Tolhurst with David Noble, chairman of the Board of Trustees, and volunteer manager Leanne Horwill. Anyone aware of a group, including people who benefit from the group’s activities, may make a nomination by completing the online form. Please don’t nominate your own group if you’re a volunteer or paid staff member so as to ensure that nominations are independent and supported. 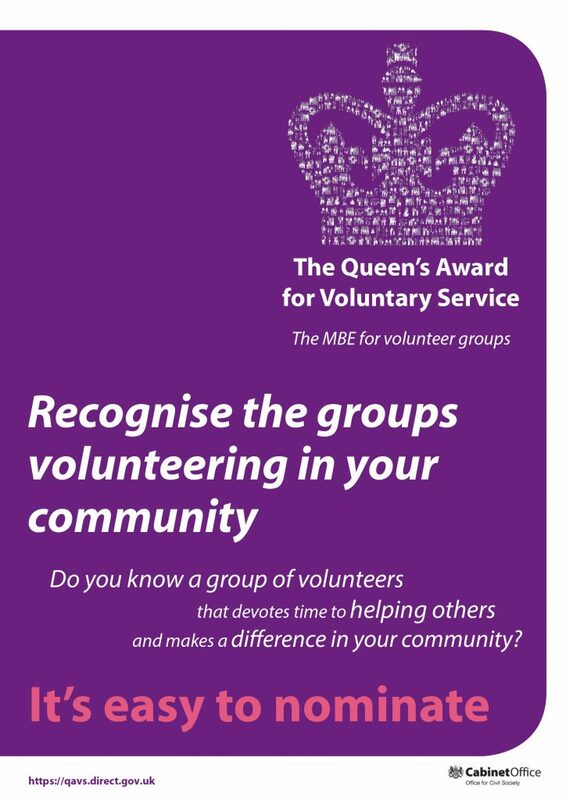 The Queen’s Award for Voluntary Service is for outstanding achievement by groups which volunteer their own time to enhance and improve the quality of life and opportunity of others in the local communities. It is the highest award given to volunteer groups across the UK. The Queen’s Award for Voluntary Service was established by HM the Queen in 2002 to celebrate the 50th Anniversary of her Coronation; the first awards were given in 2003. Winners receive a certificate signed by the Queen and a domed glass crystal both presented by The Lord-Lieutenant. Representatives from the group may also be invited to attend a royal garden party. Volunteer groups should have been running for three years or more to be nominated. Any group of two or more people doing voluntary work can be nominated but the majority of the group must be volunteers and more than half the volunteers must have the right to live in the UK. The group will need to know they are being nominated. To nominate a group, you must be independent from the group. You could be, for example, someone who benefits from the group’s work or someone who’s aware of the group’s work. The letters can come from a wide range of people, e.g. those who receive the service, those who know about the service provided, councillors, police officers, mayors, MPs, religious leaders, fire officers, teachers – they do not have to be from people occupying senior positions. A panel overseen by the Lieutenancy, looks at evidence about the group’s activity, the group’s impact and reputation and how it may have overcome obstacles. The nomination needs to show the panel evidence that the volunteer activity is exceptional, along with information that brings out the roles of volunteers and whether the activity of the group is volunteer-led. Volunteer-led does not mean that ‘only volunteers’ must be involved in the work of the group, it just means that there must be evidence of the volunteers taking a leading role in key aspects of the work of the group. 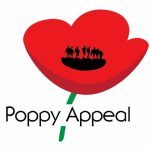 Also taken into account is how far the group has achieved, or is moving towards achieving, standards of excellence in its organisation and its volunteers. Anyone aware of the group, including people who benefit from the group’s activities, may make a nomination by completing a form. Please don’t nominate your own group if you’re a volunteer or paid staff member so as to ensure that nominations are independent and supported.